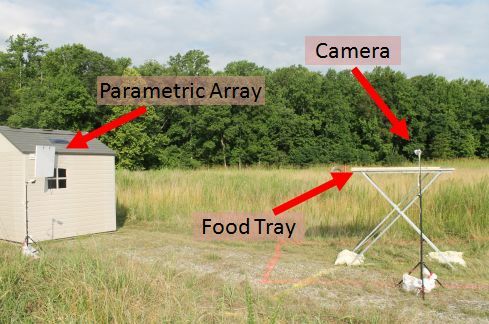 A capped landfill with tall grass near a wooded area was the site of another field test of the Sonic Nets technology. Cameras were placed to record two feeding tables stocked with mixed seeds and sunflower seeds. Twenty days of data were collected with the Sonic Nets sound on one or the other feeding table. Five days of baseline data as well as post experiment data were also collected. Analysis of the video collected is still on-going, but preliminary results indicate a reduction similar to the 85 percent observed in the airfield trial.